Left to right are Cameron, Tara and Kenna Zier. Diagnosed with stiff-person syndrome — an extremely rare autoimmune neurologic condition — Tara Zier looked to Mayo Clinic for help. There she found valuable guidance and gained a new outlook on how to manage her condition. For three years, Dr. Tara Zier went from specialist to specialist in the Washington, D.C. area trying to find out what was causing the unexplained symptoms she had been experiencing: shortness of breath, fatigue, difficulty walking and excruciating back pain. On her fourth visit to a local emergency department, the dentist from Bethesda, Maryland, remembers lying on a hospital bed crying. "My hips were stiff, and I was having a hard time walking," Tara says. "I had no idea what was going to happen. I was really scared." Her symptoms began in January 2015 after a weeklong bout of pneumonia and three months after her former husband died. "I was devastated," she says. "The level of stress was way off the charts. It was nothing I could even describe." 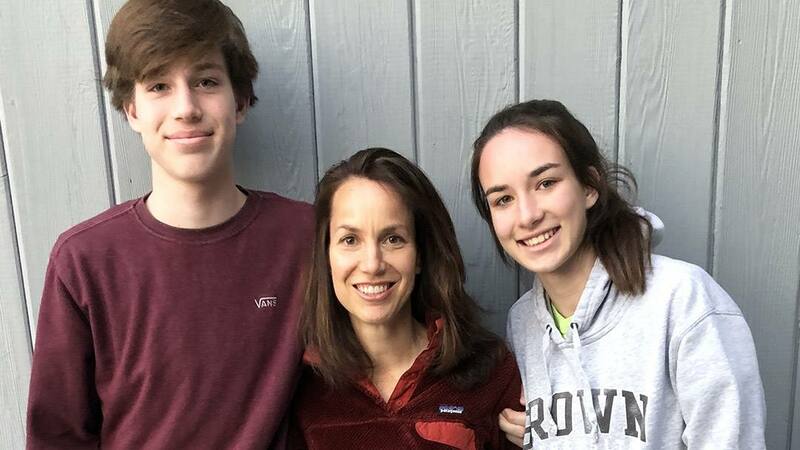 Grief-stricken and trying hard to help her two children through their grief, the active 45-year-old started having difficulty exercising, and she experienced extreme fatigue. Despite taking kickboxing for years, she was getting short of breath during classes. She also experienced panic attacks regularly, which landed her in the emergency department several times. "My kids were 12 and 14 at the time," she says. "I was worried they would lose me, too." Tara's symptoms persisted, and the following year she started battling severe neck pain. "It felt like a deep spinal pain," Tara says. "I backed off from kickboxing and martial arts, but I was still short of breath and just didn't feel great." Multiple MRIs and consults with several neurologists revealed Tara had spondylosis in her neck. She decided against surgery and instead sought relief through physical therapy and chiropractic visits. But her condition continued to deteriorate. "I was pale. I couldn't eat. I was down to 107 pounds. My body was in crisis." After two years of searching for answers, Tara says things came to a head one night in March 2017 when she took her children out for a family dinner. "I was pale. I couldn't eat. I was down to 107 pounds," she says. "My body was in crisis." She went to her primary care doctor who suggested Tara take the antidepressant Cymbalta, which can be used to treat certain forms of pain. She then went on to seek the opinion of an endocrinologist, psychiatrist, rheumatologist, a general cardiologist and an electrophysiology cardiologist. But her symptoms persisted, disrupting daily life. "My in-laws moved in with me for three weeks during the time I couldn't function," Tara says. "I hired a woman to cook and help around the house, and had to hire someone to drive my daughter to soccer practice." When a friend who has postural tachycardia syndrome described symptoms similar to hers, Tara asked her primary care doctor for a referral to a local neurologist who specialized in dysautonomia — disorders of autonomic nervous system, such as postural tachycardia syndrome. "He told me that stress can throw your nervous system into fight-or-flight mode," Tara recalls. "He thought that all of the stress I had been through had caused the dysautonomia, and in a year and a half I would recover. I thought, 'OK, maybe there's a light at the end of the tunnel.'" The neurologist put Tara on a medication to treat nerve and muscle pain, a beta blocker and a skin patch for chronic pain. But instead of improving, her symptoms got worse. She started feeling numbness on the left side of her face, and she noticed itching in her abdomen and between her shoulder blades. Tara found a new primary care doctor in summer 2017 who did a full body CT scan and referred her to another neurologist who ordered several blood tests. The results revealed a rare disorder: stiff-person syndrome. Tara's primary care doctor recommended she consider going to Mayo Clinic. Tara made an appointment with Andrew McKeon, M.B., B.Ch., M.D., a neurologist who is part of the Mayo Clinic Center for Multiple Sclerosis and Autoimmune Neurology and co-director of the Neuroimmunology Laboratory. "Stiff-person syndrome is a very rare autoimmune disease of the central nervous system that was discovered at Mayo in 1954. It has a one-in-a-million diagnosis," Dr. McKeon says. "We only saw 100 patients with this condition between 1984 and 2008 as part of a large cohort study Mayo conducted on our Rochester campus, where we have a specialized clinic for people with rare central nervous system autoimmune diseases." People who experience stiff-person syndrome typically have other autoimmune diseases, such as Type 1 diabetes or autoimmune thyroid disease. There are three presentations of the disorder: stiff limb, which only involves the legs; stiff trunk, which affects the back; and classical stiff-person syndrome, which involves both the back and the legs. "Dr. Zier has a more limited type of the disorder affecting her neck and back, where she experiences a lot of spasms which cause her a great deal of pain and trouble breathing," Dr. McKeon says. Prior to her first consult with Dr. McKeon in December 2017, Tara underwent six days of immunotherapy infusions recommended by her local neurologist. Unfortunately, the therapy didn't relieve her pain, and it made her feel worse. On Dec. 10, Tara was transported to Mayo Clinic's Rochester campus by air ambulance. "I hadn't been driving in months and wasn't well enough to fly commercially, so this was the safest way to travel," she says. When she arrived at Mayo, Tara spent a week undergoing a battery of tests. "No stone was left unturned," she says. "Every part of me was evaluated from my brain all the way down." "Dr. McKeon is a great listener. I think of him as top-notch. He's very committed to helping me get better." "When I first saw her, she was on several medications that weren't helping. Very often the conversation is really about trying to think outside the box to provide pain relief," Dr. McKeon says. "We treated her spasms and pain with Valium and continued our efforts to find individualized approaches that could improve her quality of life." "Dr. McKeon is a great listener. I think of him as top-notch," Tara says. "He's very committed to helping me get better." In an effort to help Tara live a full life despite her pain, Dr. McKeon referred her to Mayo Clinic's Pain Rehabilitation Center. Staffed with an integrated team of health care professionals, including those who specialize in pain medicine, physical therapy, psychology, occupational therapy, biofeedback and nursing, the Pain Rehabilitation Center offers a three-week program for adults. It helps patients like Tara regain strength and stamina, and shift their focus away from pain. "A lot of patients come in and are afraid of movement. So, they lose faith," says Ross Pollert, a physical therapist assistant in the center. "Dr. Zier came in here afraid of moving. By the time she left the program, she was independent. She was a different person. It was nice to see her having faith in her own ability." "The center taught me to incorporate more physical activity into my day despite my pain and to do things in moderation. Now I do tai chi instead of kickboxing," Tara says. "The program also taught me the importance of following a regular schedule to help gain control of my life." After she successfully completed the three-week program, Tara returned to the center's six-month aftercare program in December 2018. She plans to come back to Rochester for the one-day class every six months. "It keeps me in check," Tara says. "The nicest part is I get to see Dr. McKeon and reconnect with some of the people I've met who have become friends." Dr. McKeon last saw Tara during a video consult in February. "Ultimately, she's been doing better. The fluidity of her walking has improved," Dr. McKeon says. "I think she'll likely have some symptoms going forward. But the more active she becomes, the better her quality of life will be." Daily life for Tara is easier now, and she's been able to start driving again. She's also working to manage her health by exploring holistic therapies that include a restricted diet and light therapy. In an effort to raise awareness about stiff-person syndrome that will lead to more research into the rare and often misdiagnosed condition, Tara's in the early stages of writing a book about her journey. "It's an effort to take this crappy thing and hopefully end up inspiring and helping people," she says. "Instead of waking up angry about your illness, how do you befriend it and live with it?" "If something is not right, and you're not getting better, you need to keep going to other doctors until you get the answers you need." As she reflects on what she's been through, Tara says one of the most significant lessons she's learned is the importance of taking control of your own health. "If something is not right, and you're not getting better, you need to keep going to other doctors until you get the answers you need," she says. That's what brought her to Mayo Clinic, and she's glad it did. "I would recommend Mayo to anyone. It's fantastic," Tara says. "It's so true that your environment does make a difference in your healing and overall well-being. If you're at Mayo for a week, and you're in a happy and positive environment, you can actually feel better. It's about people being human and caring." Learn more about Mayo Clinic's Pain Rehabilitation Center. Read about the Department of Neurology.